We would like to start by clearing up any concerns from our current Hide-a-Pod customers. The Zune leap year bug cannot spread into your iPod. Each Hide-a-Pod has a layer of our proprietary protective spray coating on the inside to stop such leakage of inferior technology. You may rest easy knowing that your precious iPod is protected. For those of you with locked up Zunes, feel free to send them our way and we’ll recycle them into safe Hide-a-Pods for resale. Problem solved. Just when we thought the Hide-a-Pod phenomenon had almost fully died down, 9 to 5 Mac brought it back up and related it to presidential politics and Barack Obama. Who would have thought? It is being widely reported that the original Zune has been dumped to Woot for a $100 bargain price. Well, that’s what happens when a product isn’t selling. If this trend keeps up we’ll have another ready source of Hide-a-Pod parts. Just doing our part to keep the landfills clean. The folks over at PCWorld have created a top 10 list of the Ugliest Products in Tech History. You know what made the list, don’t you? That’s right, Zune. And they cite the popularity of Hide-a-Pod as one of the proofs of that ugliness. To be fair, (and beat the commenters to it) Apple also made the list with their 2001 Flower Power iMac. Yeah, I suppose that was deserved. I was thrilled to see Cali Lewis of Geek Brief TV wearing the Hide-a-Pod t-shirt I sent over. I’ve been a big fan of the Brief since the beginning, so seeing Hide-a-Pod on yesterday’s episode (#0216) was a huge honor. Thanks Cali and Neal! For those of you who haven’t heard of Geek Brief yet, be sure to head on over and get your fill of shiny, happy tech news. 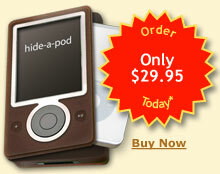 Who Is Behind This Hide-a-Pod Thing? I got a good chuckle reading many of the comments on the Digg page (and other social media sites) for the Hide-a-Pod posting. One of my favorite comment threads was the speculation about who was behind the Hide-a-Pod Web site. Someone suggested that it might actually be Apple in disguise! After all, they looked up the domain record and the information was hidden. Well, let me introduce myself. My name is Doug Smith and I’m not associated with Apple or any other big company. It’s right there in the footer of the site and it really is true. I’ve been around the ‘Net for a long time — way before there even was a Web. Although I’ve been active in many online communities over the years, I tend to just blend in by having such a common name. I’m currently involved in a number of small Web sites in a variety of capacities. If you care, you can have a look at my very outdated recently updated personal Web site. It was originally created as a place to post some of my home automation articles and whatever else I found interesting. One of these days I’ll convert it all to WordPress and start blogging some of the articles and ideas I have queued up. So why the hidden domain record? No big secret here. Many domain registrars have a hiding feature to reduce the scams and spam you would normally receive by having a public record. I highly recommend the practice as it saves many a headache. See you next time. I’ll explain the motivation for creating an entire site just for a joke. My intention is to post weekly occasionally with all the behind the scenes information as long as there is interest. Greetings to all of you new visitors! It’s been quite a ride over the last week with all the traffic from digg and various other social and media sites. I just wanted to post a quick note to let everyone know that I will be doing a series of blog posts answering some of the questions about Hide-a-Pod. I’ll cover who’s behind this (not Apple), the motivation for building a whole site for a joke, why I used WordPress, weathering a digg storm, ideas on why this did well on digg, mistakes I wish I’d done differently, and things I’ve learned. I’ll probably wait to post until the beginning of August when I get a fresh batch of bandwidth from my provider. My allocation for this month has been fully dugg out. This will also give a little time see how long the traffic impact lasts so I can report on that too. Subscribe to the feed now or subscribe by e-mail through FeedBlitz and you’ll be all set for when the articles are posted.